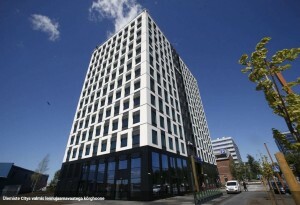 On June 20th the completion of a new 13-storied office building located at Lõõtsa St 12 was celebrated in Ülemiste City. The 9000 sq m building located in the vicinity of the airport is named after Alexandre Liwentaal, an aviation legend with Estonian roots. The building is developed by Technopolis Ülemiste AS and built by Nordecon AS. The architect is Ilmar Klammer.